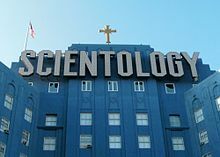 The Church of Scientology is a multinational network and hierarchy of numerous ostensibly independent but interconnected corporate entities and other organizations devoted to the practice, administration and dissemination of Scientology, a new religious movement. 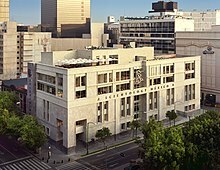 The Church of Scientology International (CSI) is officially the Church of Scientology's parent organization, and is responsible for guiding local Scientology churches. At a local level, every church is a separate corporate entity set up as a licensed franchise and has its own board of directors and executives. 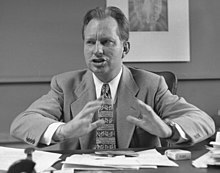 The first Scientology church was incorporated in December 1953 in Camden, New Jersey by L. Ron Hubbard. Its international headquarters are located at the Gold Base, in an unincorporated area of Riverside County, California. The location at Gilman Hotsprings is private property and not accessible by the public.Scientology Missions International is under CSI and oversees Scientology missions, which are local Scientology organizations smaller than churches. The Church of Spiritual Technology (CST) is the organization which owns all the copyrights of the estate of L. Ron Hubbard. Although in some countries it has attained legal recognition as a religion, the movement has been the subject of a number of controversies, and has been accused by critics of being both a cult and a commercial enterprise. The church has also purchased buildings for the purposes of setting up Ideal Orgs, but which have been delayed or canceled. In the UK, delayed Ideal Orgs have included Birmingham (purchased in 2007),Gateshead (purchased 2007),Manchester (purchased 2006), and Plymouth (purchased 2009). The delays have prompted calls from locals for a compulsory purchase of the historically significant buildings, which remained largely vacant and undeveloped since purchase. The Birmingham org was opened in 2017. On Friday March 28, 2008, Kaja Bordevich Ballo, daughter of Olav Gunnar Ballo, Norwegian parliament member and vice president of the Norwegian Odelsting, took a Church of Scientology personality test while studying in Nice. Her friends and co-inhabitants claim she was in good spirits and showed no signs of a mental breakdown, but the report from the Church of Scientology said she was "depressed, irresponsible, hyper-critical and lacking in harmony". A few hours later she committed suicide by jumping from her balcony at her dorm room leaving a note telling her family she was sorry for not "being good for anything". The incident has brought forward heavy criticism against the Church of Scientology from friends, family and prominent Norwegian politicians.Inga Marte Thorkildsen, parliament member, went as far as to say "Everything points to the scientology cult having played a direct role in making Kaja choose to take her own life". Scientologists can attend classes, exercises or counseling sessions for a set range of "fixed donations"; however, membership without courses or auditing is possible. According to a sociological report entitled "Scientology: To Be Perfectly Clear", progression between levels above "clear" status cost $15,760.03 in 1980 (equivalent to $46,885 in 2017) (without including additional special treatments). Scientologists can choose to be audited by a fellow Scientologist rather than by a staff member. In Israel, according to Israeli professor of psychology Benjamin Beit-Hallahmi, "in various organizational forms, Scientology has been active among Israelis for more than thirty years, but those in charge not only never claimed the religion label, but resisted any such suggestion or implication. It has always presented itself as a secular, self-improvement, tax-paying business." Those "organizational forms" include a Scientology Organization in Tel Aviv. Another Israeli Scientology group called "The Way to Happiness" (or "Association for Prosperity and Security in the Middle East") works through local Scientologist members to promote The Way to Happiness. An Israeli CCHR chapter runs campaigns against perceived abuses in psychiatry. Other Scientology campaigns, such as "Youth for Human Rights International" are active as well. There is also an ultra-Orthodox Jewish group that opposes Scientology and other cults or missionary organizations in Israel,Lev L'Achim, whose anti-missionary department in 2001 provided a hotline and other services to warn citizens of Scientology's "many types of front organizations". ^ Charles L. Stafford; Bette Orsini (1980-01-09). "Scientology: An in-depth profile of a new force in Clearwater" (PDF). St. Petersburg Times. Archived from the original (PDF, 905K) on January 24, 2016. Original (18M) Archived August 9, 2007, at the Wayback Machine. ^ Glick, Julia. "County ordinance raises questions about Scientology Archived October 14, 2010, at the Wayback Machine.." The Press-Enterprise. Tuesday January 6, 2009. Retrieved October 21, 2009. ^ McGavin, Gregor. "Scientologists' presence in Inland area dates back to 1960s Archived September 26, 2010, at the Wayback Machine.." The Press-Enterprise. Tuesday January 15, 2008. Retrieved October 21, 2009. ^ McGavin, Gregor. "Scientologists' presence in Inland area dates back to 1960s Archived September 26, 2010, at the Wayback Machine.." The Press-Enterprise. Tuesday January 15, 2008. Retrieved on October 9, 2009. 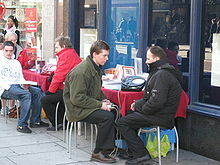 ^ Dissemination by Churches of Scientology through "Field Staff Members" Archived July 15, 2007, at the Wayback Machine., "Field Staff Member: a Scientology parishioner who introduces others to Scientology through personal contact." ^ UNITED STATES TAX COURT, MICHAEL AND MARLA SKLAR, Petitioners v. COMMISSIONER OF INTERNAL REVENUE Archived August 9, 2007, at the Wayback Machine., Respondent. Docket No. 395-01. Filed December 21, 2005.